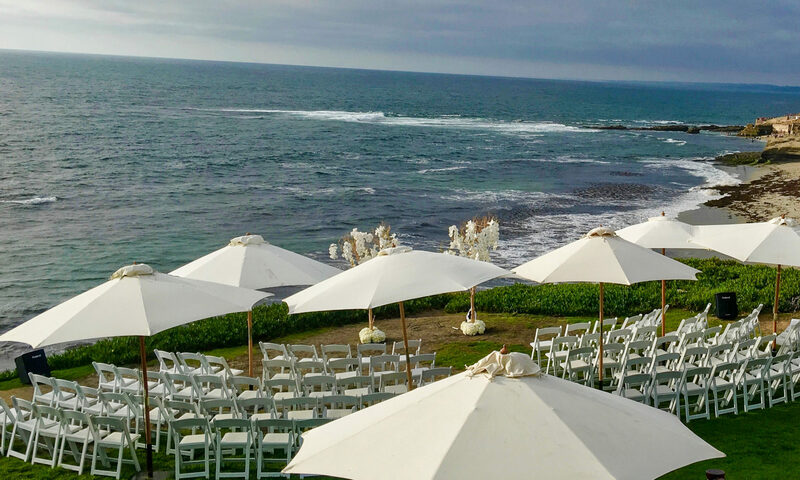 Audio services for beach and park weddings! www.ceremonyaudio.com (“we”, “us” or “Company”) respects your privacy and are committed to protecting it through our compliance with this policy. This policy describes the types of information we may collect from you or that you may provide when you visit our websites www.ceremonyaudio.com (the “Website”) and our practices for collecting, using, maintaining, protecting, and disclosing that information. The Website is not intended for children under 13 years of age. No one under the age of 13 may provide any information to or on the Website. We do not knowingly collect personal information from children under 13. If you are under 13, do not use or provide any information on this Website or on or through any of its features, including your name, address, telephone number, e-mail address, or any screen name or user name you may use. If we learn we have collected or received personal information from a child under 13, we will delete that information. If you believe we might have any information from or about a child under 13, please contact us. What information do we collect about you and how do we collect it? about your internet connection, the equipment, operating system, and browser that you use to access the Website and usage details. Information that you provide by filling in forms on our Website. This includes information provided at the time you submit a contact or information request form, register to attend a training session, or subscribe to our e-mail newsletters. We may also ask you for information if you report a problem with our Website. Details of your visits to our Website, including traffic data, geolocation data, logs, and other communication data and the resources that you access and use on the Website. The technologies we use for this automatic data collection may include Cookies and other tracking. www.ceremonyaudio.com hosts several tools and calculators on www.ceremonyaudio.com that provide the ability for visitors to connect to certain Google products, like Google Analytics. Different www.ceremonyaudio.com tools may ask for different permissions, so it is important to review the requested permissions before allowing access. www.ceremonyaudio.com applications to work properly, a user must begin the process by clicking the ‘Connect’ button. The user will be taken to a secure page on Google.com via a new window or tab, where the permissions the tool requires will be displayed. If the user consents to grant www.ceremonyaudio.com’ permission, Google will issue a token that our tools can use to access the requested information. www.ceremonyaudio.com only requests temporary access to a user’s Google application. After receiving permission, www.ceremonyaudio.com can, within the scope of the approved access, request information about, or data from, any account the user has access to. By default, our access to a user’s information expires after one hour. By default, our tools are able to see the email address of the of the user’s account, if the user opts to use our tools and provides authentication. We do not capture or store this information on our servers. Our tools do not ever see or store a user’s password, as that is entered on a secure window or tab on Google’s website and is not visible to us. www.ceremonyaudio.com employee or other individual has access to user email addresses or the results of the tools, including the data received from Google, unless the user explicitly opts-in to sharing results via email or signing up for email newsletters. We do not request the ability to extend the lifetime of the token (termed ‘Offline Access’). We do not store or receive the token on our server anywhere; the token itself is only accessible by the user’s browser. www.ceremonyaudio.com, and others, have been granted access to your information, and to see which permissions have been granted, review your connected applications here: https://myaccount.google.com/permissions. The information that we request is used by our tools in calculations and visualizations about your selected data. Again, we do not store your information by default; however, depending on the tool, we may ask if you would like to share or email the results of your information. If offered, this step is voluntary but may allow us to receive a copy of your information so that we may provide recommendations, analysis, or follow-up support regarding your use of the tool or your individual results. If you share your results with others via email, or specifically ask for www.ceremonyaudio.com to follow-up, we may follow up infrequently to offer support, answer questions, or offer services. www.ceremonyaudio.com maintains an email newsletter to help communicate information about our recent blog posts, upcoming trainings, and other general informational and marketing purposes. You can opt-out of these electronic communications at any time by following the instructions in our emails. When you register for updates, we will send you content related to your choices. At any time, you may update your subscription settings to change the frequency or types of emails, or opt-out completely of these electronic communications by following the instructions in our email. We may also use your information to contact you about our own and third-parties’ products and services that may be of interest to you. If you do not want us to use your information in this way, please click the unsubscribe link in an e-mail (see Choices About How We Use and Disclose Your Information). We may use the information we have collected from you to enable us to display interest-based advertisements to our advertiser’s target audiences. Even though we do not disclose your personal information for these purposes without your consent, if you click on or otherwise interact with an advertisement, the advertiser may assume that you meet its target criteria. Disclosure of Your Information for Third-Party Advertising. If you do not want us to share your personal information with unaffiliated or non-agent third parties for promotional purposes, you can also always opt-out by sending us an email stating your request. Promotional Offers from the Company. If you do not wish to have your contact information used by us to promote our own or third parties’ products or services, you can opt-out by sending us an e-mail stating your request. We have implemented measures designed to secure your personal information from accidental loss and from unauthorized access, use, alteration, and disclosure. The safety and security of your information also depends on you. Where we have given you (or where you have chosen) a password for access to certain parts of our Website, you are responsible for keeping this password confidential. We ask you not to share your password with anyone. Unfortunately, the transmission of information via the internet is not completely secure. Although we do our best to protect your personal information, we cannot guarantee the security of your personal information transmitted to our Website. Any transmission of personal information is at your own risk. We are not responsible for circumvention of any privacy settings or security measures contained on the Website and the Company is not and shall not be responsible for any loss or fraud as a result of such circumvention.